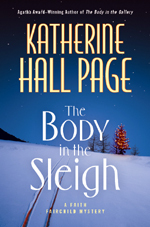 Katherine Hall Page, author of the Faith Fairchild mystery series, is giving away a signed advance copy of the next book in the series, The Body in the Sleigh, currently scheduled for publication this October. It is the 18th in this award-winning series that began in 1990 with The Body in the Belfry, which won the Agatha Award for Best First Novel. Entering is easy! Simply visit Katherine-Hall-Page.org and click on the contest link. The winner will be drawn at random on October 12, 2009. Synopsis for The Body in the Sleigh: It's Christmastime, and the Fairchild family is spending the holidays on idyllic Sanpere Island in Maine while the Reverend Thomas Fairchild recuperates from surgery. His caterer wife, Faith, is rejoicing in the rare holiday family time together, watching ice boaters, snowshoeing, and doing plenty of reading in front of the fire. Meanwhile, Mary Bethany, a local spinster who raises goats, happens upon a newborn baby boy lying in the manger of her barn on Christmas Eve. The only clues to his identity are a note in the basket asking her to take care of him, as well as an alarming amount of cash. As Faith helps Mary locate the baby's mother, she soon finds that the truth behind the abandonment is connected to Norah's last days — and that just as death and life are intertwined on Sanpere, so are evil and redemptive goodness. First Clues: Mysteries for Kids, your source for information on over 100 mystery series for children and young adults where each series is conveniently listed under four different age categories (New Sleuths, ages 4 to 6; Future Sleuths, ages 7 to 9; Sleuths in Training, ages 10 to 12, and Apprentice Sleuths, ages 13 and older), is pleased to announce 10 new mystery books (8 series books) scheduled for publication during June, 2009. Wilson had just finished his first week of school and could not wait for the next one to begin. He was very fond of his new teacher, Miss Lovely. But something was wrong that day—very wrong. There were no school buses, the school itself was empty, and something strange was approaching. Undeterred and ever-hopeful that he would see Miss Lovely soon, Wilson went through his normal school day alone—he did his math lesson alone, his science lesson alone, sent himself to the principal’s office when he was naughty, and more, but still ... something was approaching. Stadler skillfully uses gatefold flaps to keep the suspense mounting until we find out just who—or what—was approaching in the first book of this series. The Back-to-School Mystery Series are recommended for readers aged 4 to 6. In the town of Ghostly, where everything is spooky, something really strange is going on: Books are disappearing! And not just any books—only those written by the famous author Edgar Bleek. Luckily ace reporter Dirk Bones is on the case. As Dirk tracks down information about the only clue—a weird spotted leaf—the mystery gets even more bizarre. What is happening in Ghostly? Expect the unexpected in this second Dirk Bones mystery about a fearless reporter in a town full of silly, creepy creatures. The Dirk Bones Series are recommended for readers aged 4 to 6. Aunt Molly is in town. Cam Jansen and her best friend, Eric, are at the airport to greet her. They find Aunt Molly, but her favorite high heels are missing! Did she leave them in Peru, or China, or behind a trash can? Will gumshoe Cam find Aunt Molly’s missing shoes? The 14th book in this delightful Level 2 reading series. For older readers, see also the Cam Jansen mystery series. The Young Cam Jansen Series are recommended for readers aged 4 to 6. Alec Flint is a super sleuth in training, with one mystery under his belt, and a really great partner named Gina. When Gina's mom, a local newspaper reporter, gets a ransom note at work, Alec and Gina are on the case. The note claims that something belonging to the whole town has been stolen ... but that something could be anything! The partners do their best to spend as much time as possible sleuthing, but their schoolwork keeps getting in the way. The entire fourth grade is doing a unit on the abstract artist Jackson Pollock that's sponsored by a distant relative of Pollock's. Alec and Gina have more important things to worry about than a bunch of paintings with lots of strange paint dripped on the canvas. But are the detectives overlooking an important clue? Could the mysterious sponsor and the abstract paintings have something to do with the ransom note? The 2nd book in this series. The Alec Flint Series are recommended for readers aged 7 to 9. Eliza is seeing things, but what she hears shakes her to the core. The Bookshop has been in her family since before the Civil War and now it s in financial trouble. Strange things are happening ... Eliza receives mysterious messages, stumbles across obscure clues, and finds hidden spaces in The Bookshop. When a creepy man starts popping up in unexpected places, she knows not to trust him. When Eliza learns he is planning to buy The Bookshop, she becomes more suspicious, convinced there is something in the family shop worth finding. It's up to three seventh graders, Eliza, her best friend Melinda, and the new kid Simon, to unravel the mystery and save The Bookshop in the first book of this series. The Acorn Mysteries are recommended for readers aged 10 to 12. In a tale overflowing with adventure, teens Bean Carver and Abigail Peterson -- and a Middle Eastern princess summering on their island -- pull off narrow escapes by boat, ultralight, and mini-submarine. Bizarre occurrences indicate that the legends surrounding nearby Burial Island-site of a tragedy during the French and Indian Wars-might not be merely folktales. Bean and Ab solve a baffling mystery, plus get some clues about the importance of loyalty and friendship. The 3rd book in this series. The Bean and Ab Mystery Series are recommended for readers aged 10 to 12. Damian's amazing detective skills are called on when rich boy, Clavin Baggington, has his super-expensive bike stolen at the Green Park Holiday Village . With a brilliant and cunning plan, Damian solves the crime in style - but not before Mum's blood pressure rises to new heights and the Holiday Village is thrown into chaos. Even Inspector Crockitt, hoping for a peaceful week's break, becomes unwillingly and painfully involved. The 7th book in this series. The Damian Drooth, Supersleuth Series are recommended for readers aged 10 to 12. Providing a colorful slice of life, mystery, light romance, and personal struggles, this adventure tale draws readers into the life of a contemporary American girl, Kayla, in her quest to pursue her dreams and find her identity in the exciting transition from childhood to early adolescence. The story takes an unexpected turn when someone steals her friend Amber's most prized possession—the gold tiara she planned to use as the crown in The Nutcracker ballet. Suddenly, Kayla and her fellow ballerina friend Vicki find themselves embroiled in the roles of amateur detectives. Kayla also discovers something very special about herself; she gets the starring role in a school play but must overcome stage fright and the difficulty of memorizing her lines all while experiencing her first crush on a boy. If it hadn’t been for Lucas’s photographic memory, they might not have remembered the man. It had been almost a year since she and Kari noticed him copying a famous Rembrandt painting in the Minneapolis Institute of Arts. But now in the National Gallery in London, they spot the same guy, copying another Rembrandt. Then, when a never-before-seen Rembrandt painting is discovered in Amsterdam, the girls begin to suspect the truth. Convinced that no one will believe them without hard and fast evidence, the teenage sleuths embark on a madcap adventure to find the forger and bring him to justice. The 1st book in this series. Also available: The Mystery of the Third Lucretia (hardcover edition). The Kari and Lucas Series are recommended for readers aged 13 and older. When a shy high school student’s body is found washed up on the shore of a quiet beach town—an apparent suicide—Terry Novak doesn’t know what to think. He decides to do some investigating with the help of his best friend, Abby. Before long, they learn that asking questions puts them in grave danger. Fortunately, Terry has been learning about fighting, thanks to a retired boxer, who teaches him to use his head and keep his feet set beneath him—lessons Terry takes to heart in more ways than one. Also available: The Boxer and the Spy (hardcover edition). This book is recommended for readers aged 13 and older. Congratulations from everyone at MBN to the winners! Sue Birch is the author of Dead Puzzling, a recently published children's murder mystery. In Dead Puzzling, 9-year-old Oliver Pickles, one of the three young heroes in the story, suffers from the autistic condition Asperger's Syndrome. While this doesn't stop him from trying to help his sister Lizzie and friend Tom track down their village killer, it doesn't always make the adventure run smoothly. Much of Oliver's amusing and unpredictable behavior is based on Sue's son Michael, who is also autistic. "Although Mike never got involved in any criminal investigations," Sue told us hastily. Sue also let us know she is donating half her royalties on the book to the National Autistic Society, the UK's leading charity for people affected by autism. 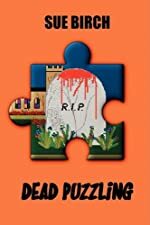 Dead Puzzling is the first in a planned series of young adult thrillers involving the trio and is available on Amazon.com and other major retailers. USA Today recently talked to Jeffrey Donovan, who stars as the "burned" covert agent Michael Westen on Burn Notice, the third season of which premieres next Thursday (June 4th, 9 PM ET/PT) on USA Network. "I'm having the best time of my life. Absolutely," says Donovan. "This is the best material I've ever had to work with, and it's getting better. The cast and crew are great. It's a marriage made in heaven." USA Today notes viewers appreciate the match. 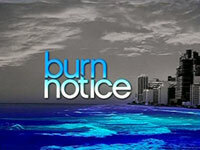 Burn Notice's "cool" factor, story lines and charismatic cast attract 5 million viewers an episode. Much of the appeal lies with Donovan's turn as the unflappable, self-deprecating CIA agent given a "burn notice," his employment terminated by unknown operatives for reasons unclear. The series, set in Miami, is popular enough have attracted a book tie-in. Tod Goldberg has written two books to date, both of which have been positively reviewed by Mysterious Reviews: The Fix (published August 2008) and The End Game (published May 2009). The first two seasons of the series are available on DVD from Mysteries on TV: Burn Notice. The Telegraph is reporting that David Suchet is set to begin filming the current season of Agatha Christie's Poirot. The first episode of the four to be filmed is The Clocks in which Poirot must determine whether a woman is responsible for the murder of a man found stabbed. The title comes from the four frozen clocks that read 13 minutes past 4 in the room where the dead body is discovered. The Clocks was originally published by Christie in 1963. "After 21 years filming Poirot I am as excited as ever to be returning to the role and very much looking forward to filming with such a wonderful guest cast," says Suchet. ITV has yet to schedule a date to broadcast the new season, but is expected to be early 2010. It is likely the episodes will air on PBS in the US soon thereafter. Visit Mysteries on TV: Agatha Christie's Poirot for more information about the series available on DVD. Help the famous consulting detective solve a string of grisly murders in Sherlock Holmes: The Secret of the Silver Earring! Team up with Dr. Watson to scour exquisitely detailed scenes, track down clues, and find the person responsible for these crimes. Use your detective skills and piece together this mystery, as you dive into a carefully constructed 19th century. Sherlock Holmes: The Secret of the Silver Earring is an adventure game full of excitement and suspense and classic characters. Also available: Sherlock Holmes: The Secret of the Silver Earring Strategy Guide. 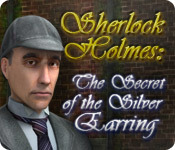 Sherlock Holmes: The Secret of the Silver Earring, a Big Fish Game Club World Premiere Exclusive, may be downloaded and purchased for $6.99 with a Big Fish Game Club membership. A sample version (173.94 MB) may be downloaded and played for free for one hour; the full unlimited version is 1.2 GB. Congratulations from MBN to the winners! Mysterious Reviews, mysteries reviewed by the Hidden Staircase Mystery Books, is thrilled (pun intended!) to be a participant in Barry Eisler's online book tour. We had the pleasure of reading his latest book, Fault Line, a review of which is published here. 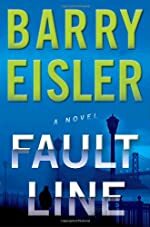 Despite four murders committed within the first chapter or two, Fault Line starts fairly slowly for a thriller. The three principal characters (Alex, Ben, and an associate of Alex's, Sarah) are introduced separately but their stories are unremarkable. It isn't until they are together that the plot picks up speed ... and interest. Together they're battling an unknown force determined to acquire the encryption software, but individually there are also interpersonal conflicts: between Alex and Ben over the accidental death of their sister when they were teenagers; Alex's unexpressed affection for Sarah, which is unreciprocated; and Ben's suspicion that Sarah may be an embedded agent because of her Iranian heritage and Sarah's resentment that he believes that. Eisler handles these various subplots well while keeping the main plot moving forward, but there's really just a little too much going on here. Special thanks to Pump Up Your Book Promotion for providing a copy of Fault Line for this review. If you are interested in purchasing Fault Line from Amazon.com, please click the button to the right. Fault Line (Kindle edition) is also available. Synopsis (from the publisher): Silicon Valley: the eccentric inventor of a new encryption application is murdered in an apparent drug deal. Istanbul: a cynical undercover operative receives a frantic call from his estranged brother, a patent lawyer who believes he’ll be the next victim. And on the sun-drenched slopes of Sand Hill Road, California’s nerve center of money and technology, old family hurts sting anew as two brothers who share nothing but blood and bitterness wage a desperate battle against a faceless enemy. Alex Treven has sacrificed everything to achieve his sole ambition: making partner in his high-tech law firm. But then the inventor of a technology Alex is banking on is murdered, the patent examiner who reviewed the innovation dies--and Alex himself narrowly escapes an attack in his own home. Off balance, out of ideas, and running out of time, he knows that the one person who can help him is the last person he’d ever ask: his brother. Ben Treven is a military liaison element, an elite undercover soldier paid to “find, fix, and finish” high-value targets in the United States global war on terror. Disenchanted with what he sees as America’s culture of denial and decadence, Ben lives his detached life in the shadows because the black ops world is all he really knows--and because other than Alex, whom he hasn’t spoken to since their mother died, his family is long gone. But blood is thicker than water, and when Ben receives Alex’s frantic call he hurries to San Francisco to help him. Only then does Alex reveal that there’s another player who knows of the technology: Sarah Hosseini, a young Iranian American lawyer whom Alex has long secretly desired--and whom Ben immediately distrusts. As these three struggle to identify the forces attempting to silence them, Ben and Alex are forced to examine the events that drove them apart--even as Sarah’s presence, and her own secret yearnings, deepens the fault line between them. A list of the top 15 mystery hardcover bestsellers for the week ending May 29, 2009 has been posted on the Hidden Staircase Mystery Books website. Some shuffling among the top 5 bestselling mysteries from last week, two titles from last week moving into the top 15, and one new title debuting this week. New York City. Two in the morning. A subway car heading uptown. Jack Reacher, plus five other passengers. Four are okay. The fifth isn't. In the next few tense seconds Reacher will make a choice–and trigger an electrifying chain of events in Gone Tomorrow, the 13th thriller in this series by Lee Child which moves up 13 places into 6th position this week. Susan Mark was the fifth passenger. She had a lonely heart, an estranged son, and a big secret. Reacher, working with a woman cop and a host of shadowy feds, wants to know just how big a hole Susan Mark was in, how many lives had already been twisted before hers, and what danger is looming around him now. Because a race has begun through the streets of Manhattan in a maze crowded with violent, skilled soldiers on all sides of a shadow war. Susan Mark's plain little life was critical to dozens of others in Washington, California, Afghanistan ... from a former Delta Force operator now running for the U.S. Senate, to a beautiful young woman with a fantastic story to tell–and to a host of others who have just one thing in common: They're all lying to Reacher. A little. A lot. Or maybe just enough to get him killed. Publishers Weekly says, "Child sets things up subtly and ingeniously, then lets Reacher use both strength and guile to find his way to the exciting climax." New this week at number 10 is the second thriller to feature crime reporter Jack McEvoy, The Scarecrow by Michael Connelly. Forced out of the Los Angeles Times amid the latest budget cuts, newspaperman Jack McEvoy decides to go out with a bang, using his final days at the paperto write the definitive murder story of his career. He focuses on Alonzo Winslow, a 16-year-old drug dealer in jail after confessing to a brutal murder. But as he delves into the story, Jack realizes that Winslow's so-called confession is bogus. The kid might actually be innocent. Jack is soon running with his biggest story since The Poetmade his career years ago. He is tracking a killer who operates completely below police radar--and with perfect knowledge of any move against him. Including Jack's. Publishers Weekly states, "With every switch between McEvoy's voice and the villain's, Connelly ratchets up the tension. This magnificent effort is a reminder of why Connelly is one of today's top crime authors." Finally, moving up 2 notches to number 14 is The Secret Speech, the second thriller with state security agent Leo Demidov by Tom Rob Smith. Soviet Union, 1956. Stalin is dead, and a violent regime is beginning to fracture-leaving behind a society where the police are the criminals, and the criminals are innocent. A secret speech composed by Stalin's successor Khrushchev is distributed to the entire nation. Its message: Stalin was a tyrant. Its promise: The Soviet Union will change. Facing his own personal turmoil, former state security officer Leo Demidov is also struggling to change. The two young girls he and his wife Raisa adopted have yet to forgive him for his part in the death of their parents. They are not alone. Now that the truth is out, Leo, Raisa, and their family are in grave danger from someone consumed by the dark legacy of Leo's past career. Someone transformed beyond recognition into the perfect model of vengeance. Kirkus Reviews says, "Leo is a fantastic creation: relentless, decent and wonderfully complicated. A superb thriller, full of pitch-perfect atmosphere." Come on board an extravagant cruise liner, the Ocean Pearl, and help Mr. Biscuits solve the murder of his owner, Mrs. Cambridge, in Mr. Biscuits and The Case of the Ocean Pearl. This hidden object game allows you to search an entire cruise ship for clues and interview a crazy cast of suspects. Each suspect will try to distract you, and remove evidence, but the lovable pug, Mr. Biscuits, will help you stay on track. 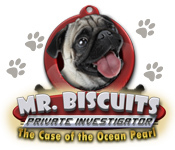 Mr. Biscuits and The Case of the Ocean Pearl may be downloaded and purchased for $6.99 with a Big Fish Game Club membership. A demonstration version (44.97 MB) may be downloaded and played for free for one hour. This Friday's free book (05/29/2009) is a Harlequin Blaze romantic suspense novel. Biotech hotshot Alexandra Kendall is in way over her head. It's bad enough that a business trip to Belize has put her in danger. But now she finds out that the man hired to protect her is none other than former FBI special agent Cole Whittaker—the same man who'd loved her (oh God, how he'd loved her …) and then left her five years ago. Reappearing in Alex's life is one of the biggest risks Cole has ever taken. Once his undercover job forced him to abandon her. Now he has the chance to redeem himself—one scorching kiss at a time. But first he must convince Alex that the safest place for her is in his bed. The Hidden Staircase Mystery Books has updated its list of new hardcover mysteries with books scheduled for publication in June 2009. Below we're listing those authors with returning series characters, new series characters, and non-series or stand-alone mysteries in separate sections. All titles are available on our June mystery books page. We're also using the "carousel" widget by Amazon.com to display a random selection of titles; refreshing this page will change the selection displayed. For more information on any of these titles, please visit the New Mysteries page on our website. If you're interested in new paperbacks, visit The Mystery Bookshelf where you can discover a library of new mysteries, also updated with June 2009 releases. Treasure Seekers: The Enchanted Canvases, a Big Fish Game Club World Premiere Exclusive, may be downloaded and purchased for $6.99 with a Big Fish Game Club membership. A demonstration version (107.51 MB) may be downloaded and played for free for one hour.